A magnificent wooden palace of the 16th century, Padmanabhapuram Palace lies at the land’s end of mainland India – Kanyakumari. 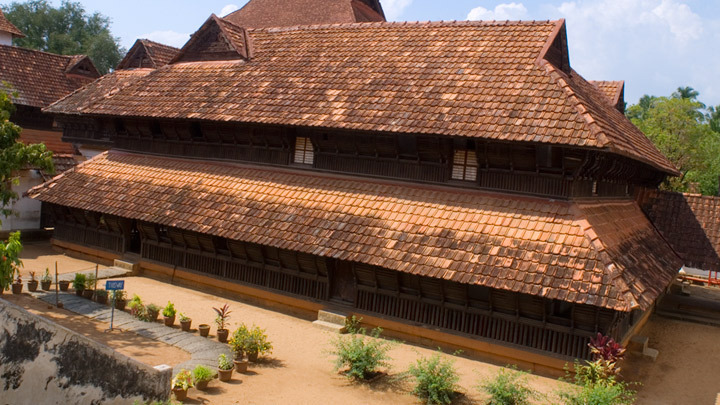 An enticing ediffice to any lover of art and architecture this old palace of the Rajas of the erstwhile Travancore (1550 to 1750 AD) is a fine specimen of Kerala’s indigenous style of architecture. The antique interiors are replete with intricate rosewood carvings and sculptured decor. The palace also contains 17th and 18th century murals. One can see: the musical bow in mahogany, windows with coloured mica, royal chairs with Chinese carvings, ‘Thaikkottaram’ or the Queen Mother’s palace with painted ceilings, rose wood and teak carved ceilings with 90 different floral designs. Durbar Hall of the palace has a shiny black floor specially made from a combination of egg white, jaggery lime, burnt coconut, charcoal and river sand, granite tubs to cool curd and buttermilk, secret underground passages, the King’s bedroom with a four poster medicinal bed, mural paintings, pictures of Lord Krishna, hanging brass lanterns lit continuously since the 18th century, open air swimming bath, granite dance hall, Saraswathi (goddess of knowledge) temple, large earthen urns, room for scribes and accountants, carved figures on columns holding oil lamps, pooja (worship) rooms with jackfruit tree columns, fish carvings on the ceilings, enormous teak beams, Belgian mirrors and an outer cyclopean stone wall fitted together without mortar. Visitors to the palace are often overwhelmed by the royal splendour of erstwhile Travancore. Though the palace is situated in Kanyakumari district of Tamilnadu State, it comes under the Government of Kerala’s administration.